Dr Karin Rosenkranz, UCL Institute of Neurology, is the lead author of a paper in 'Neurology' which outlines a new treatment for musician's dystonia, a mysterious condition that causes muscle spasms in instrumentalists. Researchers applied low-amplitude vibration to the hand muscles of four groups of people: musicians with dystonia; musicians without dystonia; healthy non-musicians; and people with writer's cramp, another form of dystonia. Earlier work led by Dr Rosenkranz suggested dystonia is caused by abnormal responses of the brain's motor cortex to sensory inputs. Using vibration on the muscles, the team hoped, would help the brain to re-learn how to respond to stimulation and stop the spasms. Using transcranial magnetic stimulation, the team tested the sensorimotor interactions in the motor cortex before and after two different interventions of hand muscle vibration applied to the thumb muscle for 15 minutes: one with subjects' attention directed to the thumb muscle, and another with attention directed away from it. The study found that in musician's dystonia patients, the sensorimotor interactions in the brain were restored to a more normal pattern after the intervention with attention focused on the vibrated thumb muscle. This effect was less pronounced in the people with writer's cramp. 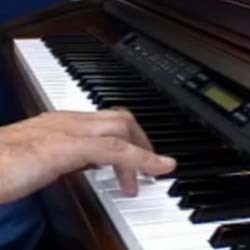 The intervention appears to offer a treatment for people with musician's dystonia. Dr Rosenkranz said: "Our hope is that stimulation can retrain how the brain responds. More research is needed to see if prolonged use of stimulation can improve hand motor function." She added: "These results also suggest that the underlying mechanism of the disorder may be different in musician's dystonia and writer's cramp." To find out more, follow the link at the top of this item.